This item is excellently designed and assembling it is very easy. Bring the bistro to your home with this beautiful bistro set. This charming table and chair set will give your home a classy look while staying modern. The design of the set will accentuate any decor scheme. This item is durable without looking institutional. Enjoy a mini getaway without ever leaving home. I love this table!! I bought it for my parents as a Christmas present, and it worked out so well! The table itself was very easy to assemble and I was so pleased that all the tools and things you need came right in the box. It is the perfect size--just enough room for a small meal for two or a nice cup of cappuchino! I am satisfied with the weight of the table and chairs, it does not at all feel cheap or flimsy. The chairs are comfortable, my parents said that they don't even feel it need chair pads or covers. I would definitely invest in this table again, maybe when I get my own place. I searched around for a while before purchasing this bistro set, and I don't think you'll find anything better than this one! You definitely get more than you pay for. Be advised: the box that it is delivered in is VERY heavy, so be careful not to throw out your back. :) Enjoy and I hope this helps! Buyer beware: I was looking for the chair sitting are to be larger than 14"-15" in diameter (that's how most of the bistro sets designed) because my husband is not a small man and I am not a small-frame woman. The description for the chair measurements stated that it's 17" in diameter, which made me to buy it. Unfortunately, when I got the set, sitting are measured barely 15". It's not Overstock fault, they were provided measurements by the manufacturer, but if this issue is deciding point in purchasing, as it was for me, just be aware. Box was slighty damaged upon receipt. However contents were well packed and protected with bubble wrap and styrofoam so nothing was damaged. All parts for assembly were in the box and well marked. Table and chair bolts in separate small bags clearly marked. Assembly instuction where clear and easily understood. Instuctions stated I should have 4 longer studs for seat back attachment but all studs were same size. All were 30 mm none were 35 mm. I was still able to assemble the seats. Only one seat needed leveling with adjustable feet after assembly. Set looks exactly as pictured and is very sturdy. However, be advised set is NOT all cast aluminum. Seat bottoms,seat backs, and table top are aluminum. All table and chair legs appear to be cast iron. the became apparent during assembly based on weight of the pieces. Also verified with a magnet which should not be attracted to aluminum but obviously was attracted and stuck to all legs. This is suppose to be an outdoor bistro set and now I'm concerned about corrosion due some parts being cast iron. Overall very satisfied with my purchase. Will have to monitor set for corrosion as usage progresses. I am very pleased with this bistro set. It is a tasteful and classy set that looks great in the courtyard area near the front door of my home. Like any bistro set, it is nice and compact to fit in a small area, yet it is heavy enough to stay put in the wind. Sitting in the chairs, I feel very comfortable and secure. Sitting outside on this set, I now enjoy coffee, wine, reading or just taking in nature. About assembly....when the set arrived, it was well packed. I found it very simple to read the instructions and assemble the set. Although the instructions said it requires two people to assemble it, I assembled it alone with ease. Someone who has very little strength might need help to lift the heavy box that it is shipped in or to hold the parts together during assembly. I was very happy that all necessary hardware (bolts, washers, screwdriver and etc.) was included with no items missing. Now that the bistro set is set up and looking great, I may order some chair cushions just to give the area a pop of color. However, in looking at the set, it is beautiful and comfortable even without cushions. Beautiful item at a great price. Shipped fast, easy to assemble. This is just the thing we needed for our patio -- for early morning coffee. This Thomas Bistro Set by Christopher Knight Home is gorgeous and sturdy, and the chairs are surprisingly comfortable even without cushions. The dark gold color is almost black with just a little patina for added character and depth. When the table and chairs arrived, my husband was impressed to find such an attractive set, which I had assembled in under thirty minutes, with the assistance of our son. He had expected something less impressive for the price I had found. We would definitely recommend this item and are even considering ordering another set exactly like it for our side garden! Bistro Set was the perfect size for my study nook! I needed an attractive, but compact, table and chairs for my indoor garden study area. This set fits perfectly! Coming from a frigid northern state, this Bistro Set brings a small touch of summer indoors for me when it's snowing outside. The Bistro Set is heavy duty - I don't worry about my nieces and nephews damaging themselves, or my Bistro Set. The Thomas Cast Aluminum Dark Gold 3-piece Bistro Set is the perfect set for either indoor or outdoor use. I would definitely recommend this set to anyone with limited space. 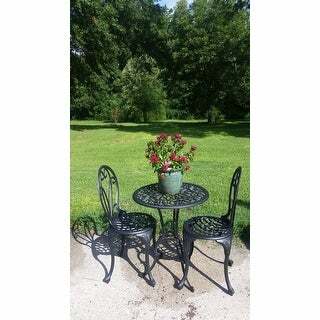 This cast aluminum chair and table set has been in the element for over one year. It is durable and has held up well to the elements. I like it because its style reminds me of old English royalty without the price. I will highly recommend this piece if you need seating on your patio, poolside or any where in the backyard. It is great for enjoying an evening or early morning coffee for two or just sit and relax and read the newspapers. You can add a cushion if you like but it is not necessary. I bought one set and got another two weeks later. It makes our back deck look like a little outdoor restaurant. Made from good quality castings ( table top and chair seats are aluminum, legs are cast iron. Iron is heavier but stronger than aluminum so I don't mind this at all ) Not likely that these will blow over. Everything went together easily ( I used my own 14 millimeter socket wrench... If you do the same, just snug up the nuts until the assembly feels sturdy, don't overtighten as cast iron CAN crack if you really overdo it. ) Very nice ornamental style. They've been left out in the rain a few times with no adverse affect, but I think I will gets some covers ( maybe air conditioner covers? ) for wintering over outside. The recommended cushions are very colorful and comfortable, and fit the chair seats exactly. 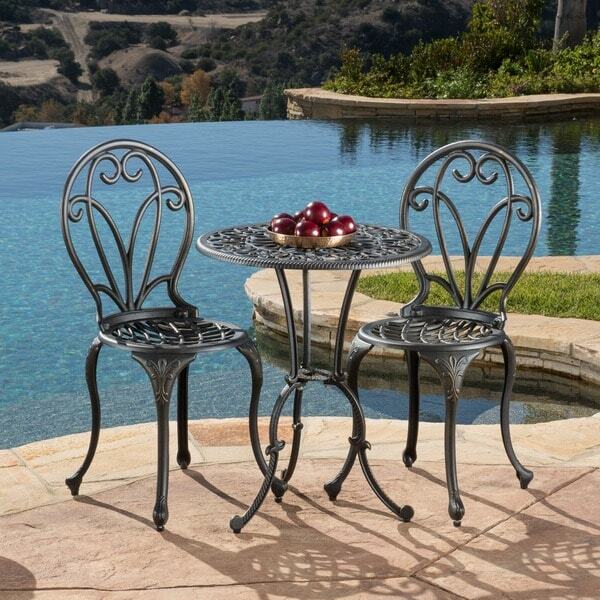 The Thomas Cast Aluminum Dark Gold 3-piece Bistro Set is exactly as pictured. The package arrived in a timely manner, as is usual with Ancestry.com. My daughter in law came over to put it together for me. She put it together easily and it is perfect for my rather small balcony. It is solid and sits evenly on the floor. I am very pleased with it and would recommend it to anyone who is looking for a bistro set. I purchased this bistro set for my front balcony. I was concerned that the gold would be too gaudy, but the set looks very classy and fits in with the traditional look of the home. It is a solid set that appears to be very durable. Assembly was not difficult; however, the box was heavy so you may require assistance lifting it. Highly recommend this item. Have you checked your set with a magnet ? I have checked mine and a magnet sticks to my metal and that means that it is made with a ferrous metal and that also means it will rust outside and they are not describing the product accurately. There should be truth in advertising. It amazes me how quickly items arrive from the O. I usually leave the assembly projects for my husband but I gave it a try this time. Very easy and precise instructions. Went together in no time. The color, quality and pricing was great. It is very sturdy and it fits perfectly in the courtyard area of our new home. Thank you O! My dear friend spent two hours assembling this set as many holes were poorly machined and did not accommodate the screws. Once assembled, it looked nice inside but in the sunlight the finish is cheap looking. I wish it were just plain black. The seat is comfortable but the back of the chair is not. Will do for now. The size is perfect for my balcony and coordinates well with the rug I had ordered on Overstock with this set in mind. Bought one on sale several years ago, and it is holding up in the salt air. Bought this one for daughter at college for balcony. It is beautiful. I am positive it will hold up for years to come. It is comfortable to sit in too, not just attractive. The seats are comfortable and sturdy, even without a cushion. It fits nicely on my balcony, and is a great place to sit and enjoy morning coffee, listening to the birds. This little bisrto set is elegant, not over done as so many I've seen. The table is large enough for a dinner plate for two, the chairs are a bit heavier than expected, but comfy. I plan to move the set inside on my sun porch for the colder weather, it's that versitile. Great buy. Only the chair tops and table tops are cast aluminum ! The legs are cast iron and will rust. Check with a magnet if you order. A magnet will not stick to aluminum. I love this bistro set. We’ve had it for 6 years now and still looks great. It’s held up well through Midwest winters and southern summers and we’ve had zero problems with it. Would absolutely buy again. I like the fact the Bistro Set takes up very little room yet gives me exactly the room I need for enjoying an outside dinning experience. .
Had this for about 6 years now and still looks great aside from a little rust on the bolt that’s in the middle of the table stand. Really nothing to complain about though. This table is on my front pouch and looks very elegant. The Table and Chairs have a dark brown rustic look. I love to sit out and have coffee in the morning on it. The table and chairs are very sturdy. Yes i would recomend this product. It is well made. Sturdy and it looks beautiful on my new front porch. Cute little bistro table - good value. We originally got it for a small balcony, and now have it outside by our pool. Very small, but slim adults can still use the chairs comfortably. "What is the shopping weight? Thank you!" "Can I use an umbrella with these tables? If so, what size? Thanks!" "Are the table & chairs heavy? Nice quality? Or light & cheap? Thank you! " The set is sturdy, heavy, and I am pleased with it. It did well through the winter here in DC, through several snows. It is perfect on my new deck. Yes, this set is quite heavy and is of good quality. The color is nearer black than dark gold but it does have golden glints when the sun catches it. "Height of chair floor to actual seat? Please." "What is the weight limit? I cannot find it. Thank you." I really don't know as weight was not an issue with me. I just wanted something to with stand midwest weather. Sorrry I couldn't be more helpful.. My shipping was free if that is what you are concerned about. I believe the weight was around 50 lbs. it is a very sturdy and heavy item. I had to drag it into the house from the front porch. Don't know how the delivery man got it there. It was easy to assemble and once out of the box in individual pieces, weight was no longer an issue. I too am unsure of the weight limits but I would say 350 or so would be a good range.. solid, thick and attractive. It is not some cheap disposable. As a matter of fact, I am an avid shopper at Overstock and I am always pleased with the high quality of the products. "I own and run a small coffee kiosk inside a train station, I am thinking of buying 2 sets for my customers. I need something small and cheaper as the station is still open to the public when I close. Do you guys think this set os a winner for me?" I love my set. It had it outdoors until recently, and it was unaffected by the weather. It's very sturdy and comfortable to sit on. I bought one of the sets and I actually love it it's not large at all it's a nice size it's good quality I think your customers will enjoy it , the chairs are comfortable and sturdy. Once a restaurant owner , yes it's a decent set and you can use a small umbrella for hot sunny days. Decent wt to it, so you don't have to worry about wind. "does this table have a hole for an umbrella?" There's a hole in the middle of the table but I don't think it's meant to hold an umbrella.